Arsenal put themselves in a very difficult position in the Champions League after losing their first two games, and thus, had to try and catch up against Bayern Munich. While they did pull out a super win at the Emirates, the super performance at the Allianz Arena came from Bayern Munich, as they romped to a 5-1 win after an incredible first half. Matchday 4 of the Champions League Group F saw Arsenal attempt to salvage any hopes of qualifying for the Last 16 against Pep Guardiola’s juggernaut of a Bayern side. For the Bavarians this clash did not hold as much importance as it did for Arsenal but a win would see them seize control of the group. Meanwhile for the Gunners, it was a must win game having lost their first two against minnows Dinamo Zagreb and Olympiakos. The last meeting between the two saw Arsenal come away with a 2-0 win but injuries to key players Hector Bellerin, Aaron Ramsey, Alex Oxlade-Chamberlain and Theo Walcott meant that Arsenal’s chances of repeating the feat were slim. Had these players all been fit it is arguable that the Gunners would have suffered the same fate against a Bayern side who had won 16 out of their last 17 home group games in the Champions League and scored 25 goals in their last four home games; an average of 5.25 per game. In the end, Arsene Wenger’s men were put to the sword in spectacular fashion, conceding five at the Allianz Arena just as Borussia Dortmund, Wolfsburg, Dinamo Zagreb and Hamburg all have this campaign. This demolition of Arsenal was without a doubt one of the most complete exhibitions of Positional Play I have witnessed this season or any other season for that matter. 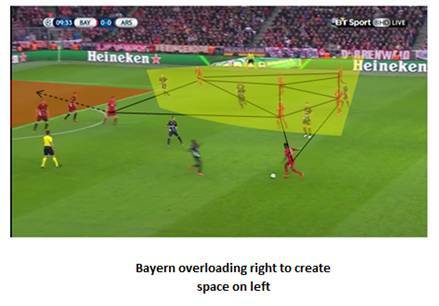 Bayern controlled almost all phases of the game, overloading the centre and wide areas throughout the contest. 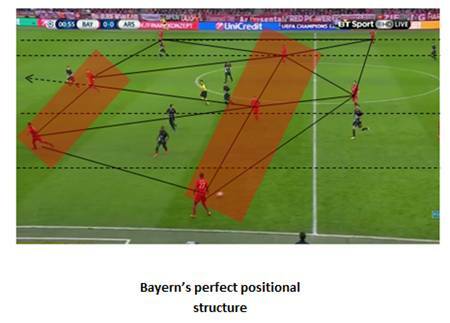 The key to Bayern creating overloads with such ease was their near perfect positional structure. Pep’s men somehow managed to overload almost all vertical zones of the field (wide areas, half spaces and centre) simultaneously thanks to the staggering and positioning of players on different vertical and horizontal lines. The result was unlimited connectivity between all 11 men and the ability to find triangular combinations at will. For much of the match Arsenal were chasing shadows as Bayern played through them with minimal fuss. Above we can see how Bayern’s shape was able to cause Arsenal so much havoc. Alaba is in possession out wide with ball and has two diagonal options in Coman and Thiago, both of whom are in the half-space. 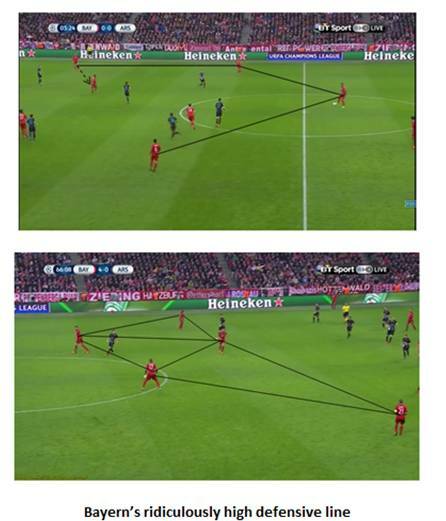 As can be seen by the triangles, Bayern have a solid structure which allows them to connect every single one of their players on the field. 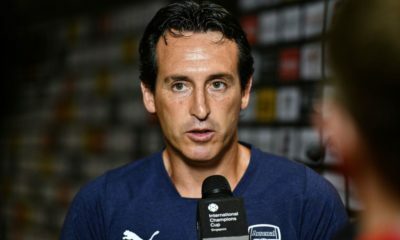 Each player has a multitude of options and Arsenal’s midfielders can be played around with ease; each player can bypass Arsenal’s pressure in midfield and the team have overwhelming superiority between the lines. In midfield, Thiago, Alaba and Alonso are between lines with Lewandowski and Coman doing the same. Lewandowski in the centre and Muller out wide on the shoulder providing depth allows even more space between the lines. Their shape was also perfect in allowing them to switch play from wide area to wide area. A common ploy by Guardiola’s Bayern is to underload one side of the field while at the same time overloading the other then switch the play to the side which has been underloaded. This was always to ensure that his wide men, Costa and Coman (and later Robben) could isolate their opposing full back and had a substantial amount of space to drive at the defender. 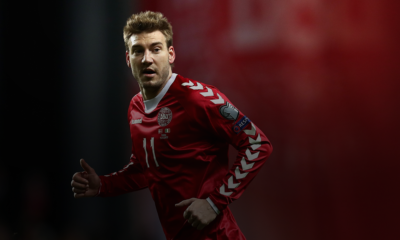 His teammates would then shift towards the ball to provide him with escape passes and opportunities for combinations. Alaba is in possession in the lead up to Lewandowski’s opener in the 10th minute. In the yellow shape Bayern have a 5v4 overload and as a result Arsenal have had to shift their defensive block to compensate for said overload. This has left the other side of the field under manned and Kingsley Coman had an enormous amount of time and space. Bayern are still connected fantastically down the right hand side and favoured a gradual switch of play rather than an immediate one with the long ball. 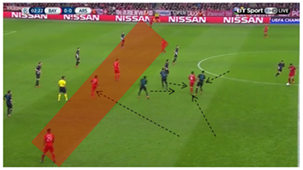 This was possibly due to the fact that a gradual shift following a succession of passes and combinations causes Arsenal’s block to be disrupted; their shape is disorganised and therefore cannot shift to Coman’s flank as a compact unit. In the end, Coman’s wide occupation opens up the half-space for Thiago who crosses into Lewandowski to head home. Credit must be given to Guardiola for the fearlessness with which he instructed his Bayern side to attack. It was because of this that they were able to create so many attacking overloads. The key was the height of the centre backs and the final third runs made by full backs Lahm and Alaba. Despite the obvious threat of being exposed in defensive transition, Guardiola still instructed his defenders to push up as high as possible, condensing the active playing area to 40-odd metres. At times his centre backs would be beyond the halfway line, something almost unheard of in modern football. 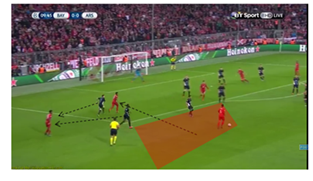 The high defensive line is the reason behind Bayern’s compactness and greater connectivity in possession. Players are all within close proximity of each other and can find an option fairly easily. Ball playing centre-backs in Jerome Boateng and Javi Martinez allow Bayern’s midfielders to push further up and occupy spaces between the lines and overload different areas of the field. 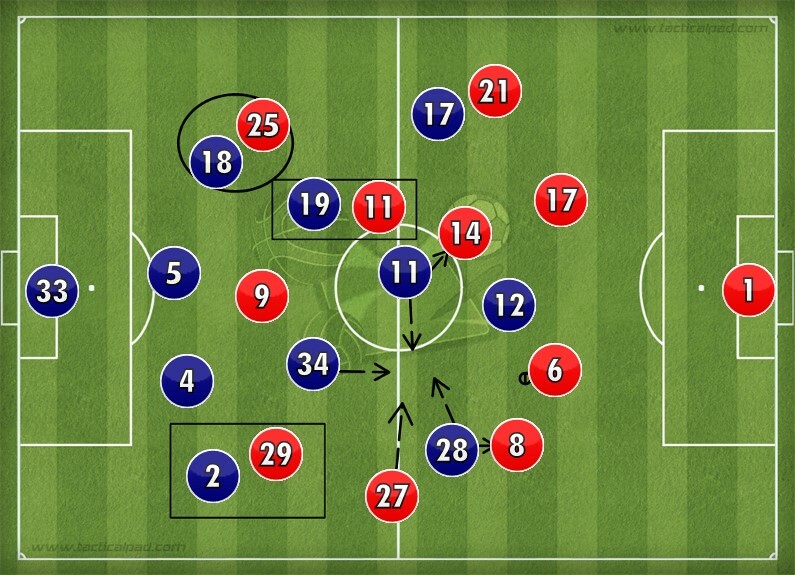 This, as well as Arsenal’s passiveness when pressing meant that the centre-backs had space and time to pick out a pass and a multitude of passing options. Normally a midfielder would have to drop deep to circulate the ball and bring it into the next phase, but with centre-backs who are competent in possession this was not as necessary and Bayern could push more players forward. Their full-backs were also key and timed their movement to perfection. 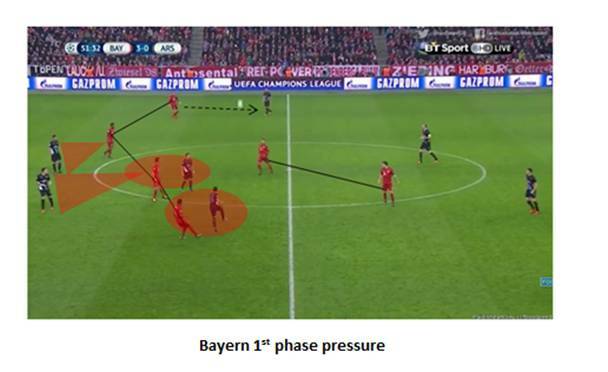 In the 1st and 2nd stages of possession, Lahm would typically stay deep and Alaba would drift into the final third and overload the left-hand side and occasionally the centre. However, neither would move into the final third immediately as they needed to ensure that possession was stable and there was balance in defence. It was only when they were in the last 2 phases that they both occupied the final third as the threat of a counter attack had been diminished. Arsenal’s Joel Campbell showed extreme vulnerability in defence and did not pose the same attacking threat as Sanchez on Arsenal’s right; and Bayern were keen to exploit this with Thiago and Alaba who were absolutely magnificent and in my mind were the key to Bayern’s victory. It was clear that the two of them were ordered to work in tandem, totalling 48 passing combinations between each other. Watching the game, both commentators would bemoan the amount of space that Man of the Match Thiago had when in possession. The reason behind this was Alaba’s co-ordinated movements allowing Thiago to receive the ball in space. 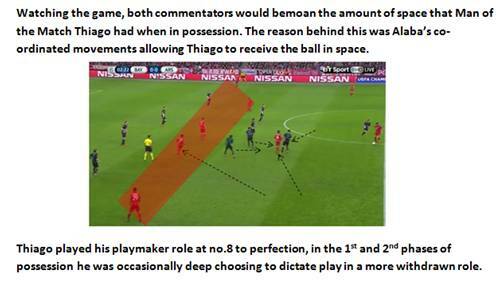 Thiago played his playmaker role at no.8 to perfection, in the 1st and 2nd phases of possession he was occasionally deep choosing to dictate play in a more withdrawn role. Alaba’s movement gave him time and space to circulate ball and play incisive passes such as the one for Lewandowski’s opener. In the image above, Alaba storms into the centre from his left-back position, taking Joel Campbell with him. Thiago moves into the left half-space and drives at the Arsenal midfield who must press in order to avoid him playing any incisive passes. 4 of the 5 players in the Arsenal midfield swarm towards him, creating room for the 4 players in between the Arsenal lines. Such is the quality of Thiago in possession that Arsenal must use multiple players to inhibit his impact. In this phase, he exhibits two key aspects of Positional Play. One is the driving towards the opposition to draw them towards him thus creating space for teammates. This falls in line with the idea of qualitative superiority. At times, when a player is 1v1 with another the situation is not always equal. Therefore, a player like Thiago must be doubled up, or even tripled up on to ensure he does not cause problems. This in turn creates space and makes it easier for his teammates as they are faced with fewer opponents. The next two images below show again how both players’ movements complement each other. Build-up to first goal. Alaba movement again makes space for Thiago who can pick out Lewandowski to head home. Despite only bagging one assist, Thiago was immense for the entire game and was at the heart of everything Bayern did in an attacking sense. He was, along with Alonso, instrumental in circulating the ball and was on task to pick up the ball from the centre-backs to bring the ball into the next phase of the attack. David Alaba deserves almost as much credit as Thiago for his performance. His half-space and central movements were key throughout the game, with one of them leading to his fantastic 25-yard strike which stretched Bayern’s lead to 3-0. Bayern’s brilliance should not take away from the fact that Arsenal were absolutely atrocious for almost the entirety of the game due to their passiveness, lack of compactness and poor co-ordination when pressing. They sat off Bayern and allowed them to wear them down and played through them with ease. In actual fact, Arsenal showed that they were more than capable of troubling Bayern Munich when they penetrated the left-hand side with combinations and rotational movement from Ozil, Sanchez and Monreal. Despite their attacking shape being ineffective in comparison with Bayern, it was their defensive shape, particularly when pressing which was the cause of their downfall in this game. Although it did improve later on, for most of the game they pressed in a disjointed manner with Joel Campbell being primarily guilty of this as well as Ozil and Giroud. 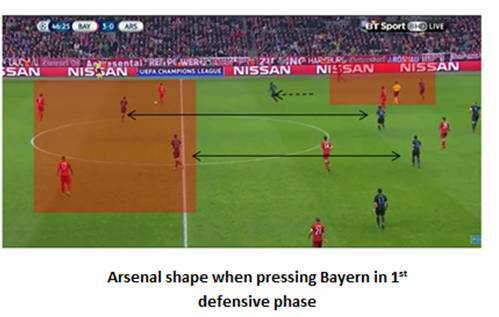 In the 1st defensive phase when Bayern were building up their attacks through their centre-backs, Arsenal often sat off allowing Bayern to dictate the game and circulate the ball. This would have been fine had their defensive shape been compact, but it was the complete opposite as players rushed to press the ball without their teammates or without waiting for triggers. In the red square, Thiago drops into the right-half space to create a 3v2 overload. The problem is that there is too big a distance between the forwards’ line of pressure (Ozil and Giroud) and the midfield. Thiago can drive at Campbell as he did so often throughout the game, causing Campbell to put pressure on him. As a result, Alaba and Coman can overload Arsenal’s left-back zone. Below is an image of how they could have set up. It is very clear to see the difference in shape between the two images. The second looks much better equipped to stop Bayern progressing into the next phase. Bayern’s shape is exactly the same with Javi Martinez in possession. Thiago has dropped as he did before but this time Cammpbell is right behind him meaning if he turns it will be straight into traffic. Giroud is blocking the passing lane to Alonso and Ozil is in behind making sure he is close so as to have access to press. Meanwhile the rest of the players have tightened up on their respective opponents. What is also noticeable is that they are still retaining their 4-2-3-1 shape, albeit a more flexible, man-oriented one. Alaba (out wide) may consider moving into the half-space but Arsenal have set up a pressing trap. If he moves into that space (red arrow), all 3 Arsenal players (Campbell, Ozil and Giroud) are in a perfect position to overload and apply pressure. As the game progressed, Arsenal grew into the game despite the fact that it was well and truly over by half-time. They began to press with greater co-ordination and intensity and took up better positions in relation to their teammates. They pressed higher up the pitch and their shape was more compact with players staggered which meant reduced space between the lines. 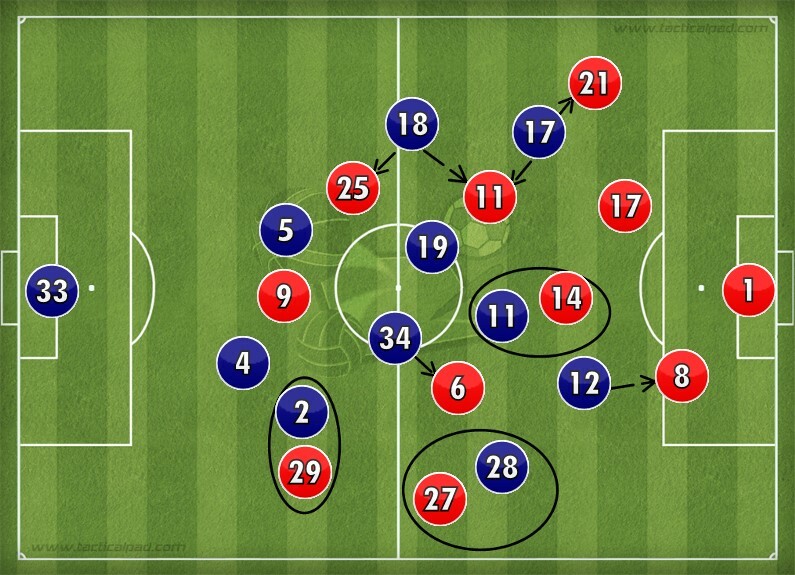 This image shows one of the few times Arsenal set up correctly when pressing. As in the previous image they still retain their 4-2-3-1 shape but are still capable of man-marking in relation to their team shape. Benatia has possession in this phase and is unable to find a passing option. Instead he tries to switch the play to Costa and possession is eventually lost. 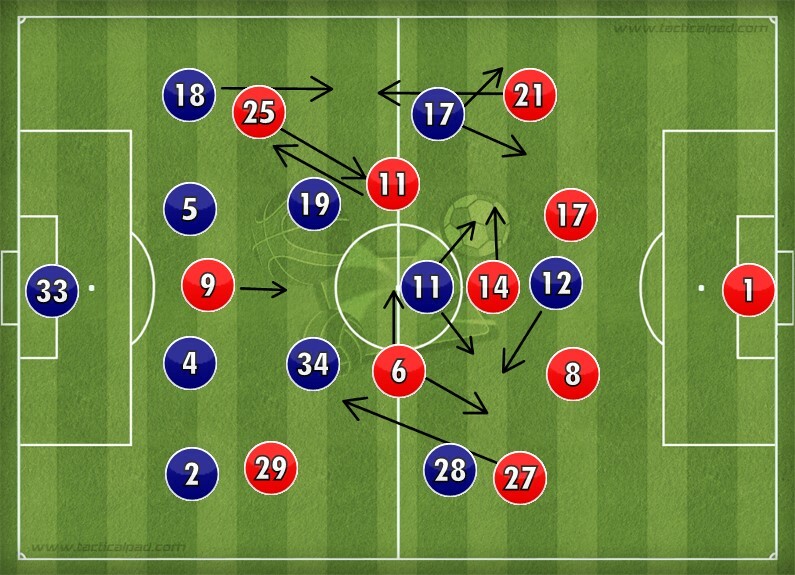 On the other hand, Bayern remained as compact as they are when attacking. They would normally retreat into a 4-1-4-1 shape if their press had been bypassed and were quick to block out passing lanes to stop Arsenal progressing into midfield. Bayern have chosen not to directly press the Arsenal centre-backs and instead look to block passing lanes to Arsenal 6s Coquelin and Cazorla. These two players are Arsenal’s main outlet for bringing the ball into the next phase. Their two forwards Lewandowski and Muller are staggered, limiting the space between lines. Alonso and Costa have stepped up to condense the space even more. However, they ensure that the Arsenal players between the lines are cut out with cover shadows. Ozil and Giroud are behind Bayern’s midfield line but are unable to have impact on this phase of the game. A resounding win for the men from Munich has seen them seize control of Group F as planned, such a convincing performance will have them believing that they can claim their 6th European Cup. This Bayern side looks more complete than any other since Pep Guardiola took over; however there seems to be a recurring theme in the Pep in Bavaria narrative. If he can keep his squad fit and focused when they inevitably win the league title in March, they have every chance of achieving European glory. For Arsenal, it is a completely different story. Their Champions League campaign has been nothing short of a disaster. 3 defeats out of 4 has left their survival hopes hanging in the balance. Barring an absolute disaster, Olympiakos will claim the second qualification spot ahead of Arsenal. After nearly 20 years at the helm, Arsene Wenger must surely see winning the Champions League as the pinnacle. Finishing 4th place in the league and reaching the knockout round of the Champions League every season should no longer be considered acceptable, especially not with marquee signings such as Ozil, Sanchez and Cech joining the Gunners in recent seasons.